Body condition score (BCS) is now included as a new trait in Breeding Worth (BW) from February. During the National Breeding Objective Review carried out in 2012, BCS (specifically late lactation BCS) was identified as an important trait to farmers. Since that time, NZAEL, a subsidiary of DairyNZ, has undertaken research to estimate the economic value of BCS. This has shown that BCS has a large economic value at $98.4 per BCS and the rate of improvement in BW could be enhanced via the inclusion of BCS. The economic value is driven by the remedial actions that a farmer needs to take with lighter cows through autumn and winter, in order to get them up to a BCS 5 before the start of calving. Achieving BCS targets is very important, as cows who calve in poor condition will be compromised for the subsequent season. The initial impact on BW will be relatively small. The vast majority of bulls and cows will have a shift in BW of +/- $10. At the herd level, this movement will typically be smaller, with almost 95% of herds experiencing shifts within the range of +/- $6. This is a breed neutral breeding value and so the impact is very similar across all breeds. 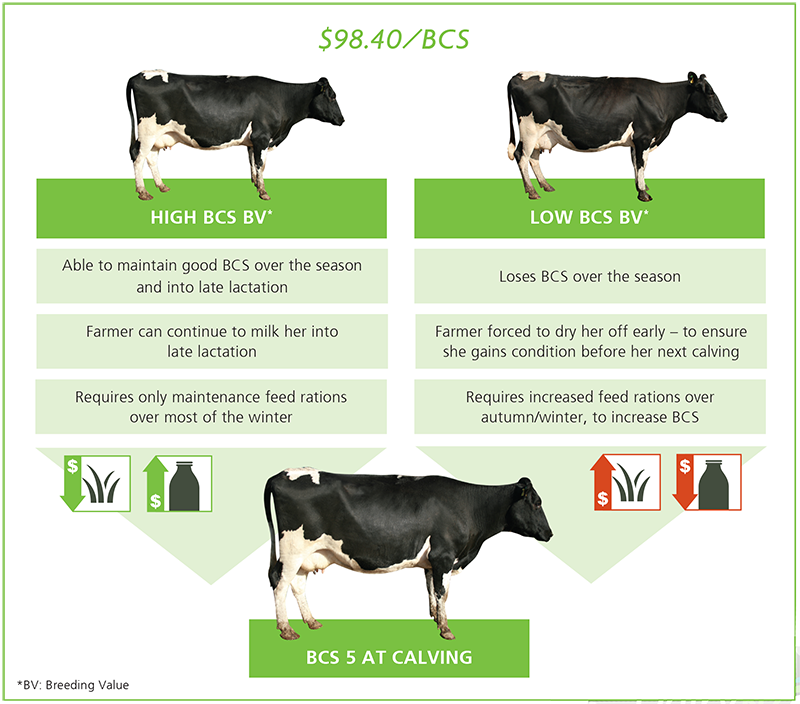 Including BCS in Breeding Worth will allow us to more accurately select for profitable dairy replacements. Over time this will lead to an enhanced rate of genetic progress in the national herd. The addition of body condition score to Breeding Worth in February will accelerate the rate of genetic gain in New Zealand dairy cows.